Figure 1. Left to Right: Lucy model with Normalized Sphere Volume, XYZ Dragon with Local Bending Energy and Armadillo with Mean Curvature. All values are normalized for visualization and were computed using the described approach. In this paper we present a novel generic method for the fast and accurate computation of geometric features at multiple scales. The presented method works on arbitrarily complex models and operates in the parametric space. The majority of the existing methods compute local features directly on the geometric representation of the model. Our approach decouples the computational complexity from the underlying geometry and in contrast to other parametric space methods, it is not restricted to a specific feature or parameterization of the surface. We show that the method performs accurately and at interactive rates, even for large feature areas of support, rendering the method suitable for animated shapes. All of the images in the paper were produced with this demo. The application works both in command line mode for batch works and in a GUI-mode for inspection. This work was supported by EC FP7 STREP Project PRESIOUS, grant no. 600533. 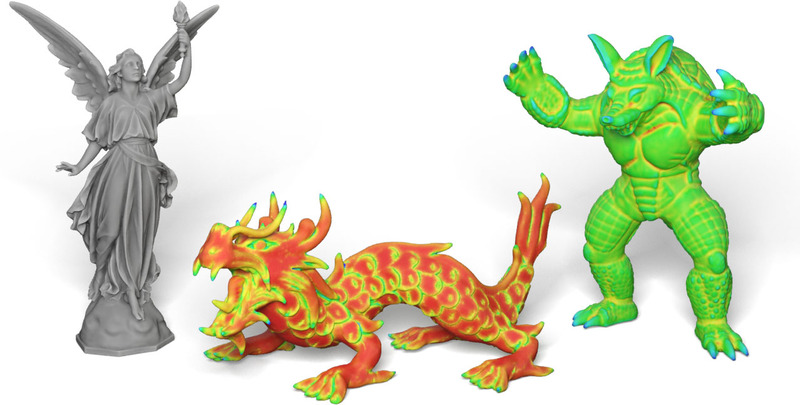 Armadillo, Lucy, Bunny and XYZ RGB Dragon models are from Stanford 3D Scanning Repository. Angel model is from the Large Geometric Models Archive of Georgia Institute of Technology. Rim model is from http://www.turbosquid.com. All other models used are from the PRESIOUS project data collection.